Laoconnection.com: What Makes Good Rice? In keeping with our other post Rice Crazy in Laos, I recall one time while I was with my grandmother she took a taste of some sticky rice and quickly quipped that it was not good rice. I was confused. I thought it was fine and I saw it cooked from its hard raw state to its final product so I figured it was fresh sticky rice. I was compelled to find out how she knew it was not good or by what definition she considered it to be inadequate. So the question became: How to evaluate rice? She would only say it didn't smell right and that when she chewed it that it was too hard. In other words, something just wasn't right. I pressed her for more specifics but she just kept saying that it was no good, and she gave me a look that said couldn't I tell too? The truth is, it tasted fine to me! But that's me. I came to realize that Lao people are very particular about rice. It can't be too starchy, can't be too over cooked or undercooked, has to have a certain subtle fragrance and taste to it. And questions abound: Is it new sticky rice you're cooking or are you just reheating previously cooked rice? How old is the rice? In its raw form, how brittle are the grains, what's its color, how does it smell, are there a lot of other impurities in the rice like pieces of rocks or stalks? etc. In its cooked state, the fragrance, chewiness, color, stickiness are also evaluated by the eater. All of these questions go into rice selection. Whether the buyer realizes it or not, in their heads they're systematically checking their own checklist to ensure that they're getting good rice. Rice in Laos is sold open in piles and typically by the kilo. So the buyer has the opportunity to touch, feel and smell the rice before it's scooped into a separate bag. For those that eat or work with rice often, ex. farmers, rice sellers or every day rice eaters, I think it's fair to say that they are aware in a general sense of what makes good rice. Though I admit farmers would have a more thorough knowledge of what's good. Sometimes it's not always easily explained though. In fact sometimes the responses to the rice quality is visceral or instinctive - like one simply knows by a slight taste, smell, texture, and color. The instinctive knowledge to rice quality stems from one's years of experience with the grain. However to get around this whole visceral reaction to quality and to get some actual criteria, the International Rice Research Institute (IRRI) has a few documents and webpages to explain all this. - In particular the links entitled Grain Quality Manual and Physical quality of milled rice. Publisher/Year: International Rice Research Institute, early 2000s? 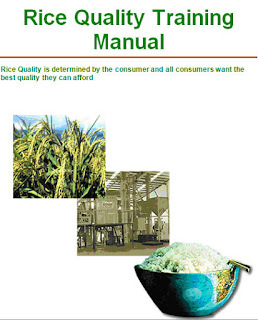 In this manual they certainly made the analysis of rice qualities and characteristics into a science. It's surprisingly lengthy and includes a list of criteria mostly from the uncooked grain point of view. It's definitely an interesting read and it's free to download. Check out the links noted above. Final Note: Knowing all this will be good for at the very least one thing. And that is being able to say to grandma whether it truly is good or bad rice.